Military Mortuary Employee Allegedly Offered Peek At John Glenn's Remains : The Two-Way DOD inspectors declined the offer and "at no time viewed the remains" during a review of the mortuary at Dover Air Force Base. The Air Force says it will investigate the incident. The Air Force says it is investigating allegations that an employee at the military mortuary at Dover Air Force Base offered to show the remains of John Glenn to Defense Department inspectors. 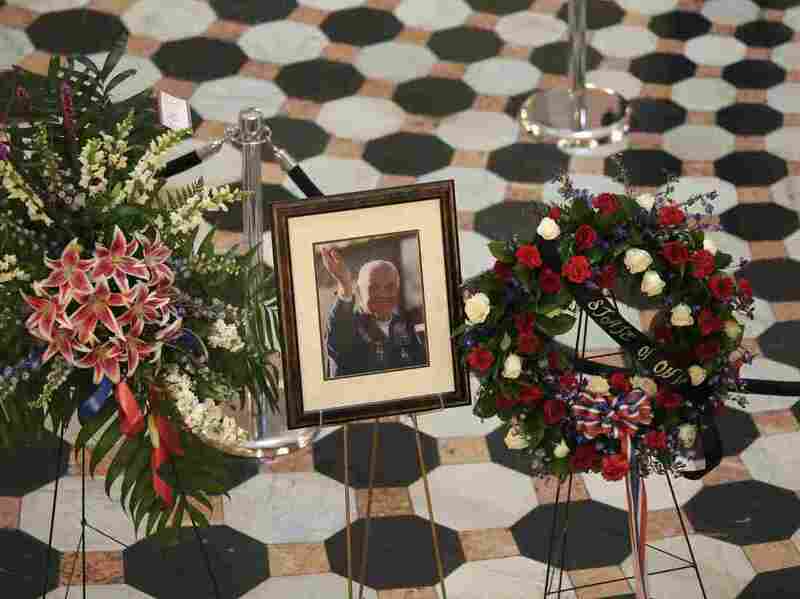 Above, a photo of the former astronaut and U.S. senator as he lay in state at the Ohio Statehouse in December 2016. The Air Force says it will investigate an incident in which an employee at the Dover Air Force Base mortuary allegedly offered to show John Glenn's remains to Defense Department inspectors. As part of a new policy, an inspection team completed a weeklong review of the mortuary at Dover in March. During the inspection, according to an Air Force spokesman, "someone reportedly offered to show the remains of Sen. John Glenn to DoD inspectors." "According to DoD, the inspectors declined the offer and at no time viewed the remains," the spokesman wrote in an email to NPR. Secretary of the Air Force Heather Wilson has directed the Air Force inspector general's office to investigate the incident. Military Times, which first reported this story Thursday, obtained an internal memo about the incident written by Deborah Skillman, the Defense Department's director of casualty and mortuary affairs. 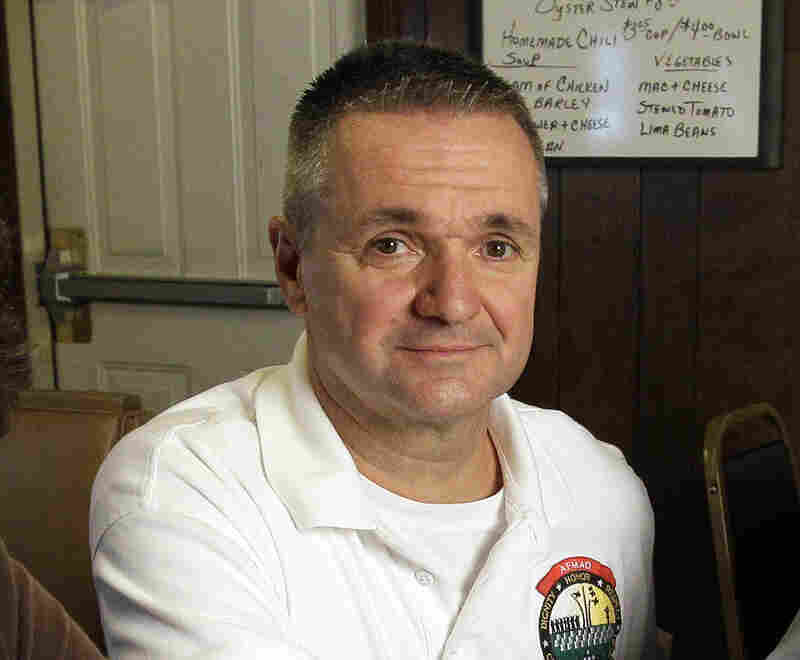 The Times reports Skillman identified William Zwicharowski, the branch chief of the mortuary, as the employee who "offered to allow the inspectors" — including Skillman — "to view the deceased." William Zwicharowski, the Dover mortuary branch chief at the time of the incident, has been reassigned, according to The Washington Post. He's shown in 2011. "Concerning to me," her memo states, according to the publication, "is that even after Mr. Zwicharowski was counseled by his chain of command regarding the inappropriate nature of his earlier offer, he repeated it. ... This breach of protocol is serious and troubling as these offers were made to members of an official Department of Defense inspection team on-site to inspect the facility and determine whether it was in compliance with applicable procedures and policy and being well-run by its leadership." John Glenn died in December at age 95; he was the first American to orbit Earth and went on to have a long career as a U.S. senator. Glenn flew 149 combat missions as a Marine. Glenn's family entrusted his body to the Air Force until his burial at Arlington National Cemetery on April 6. Dale Butland, a longtime Senate aide to Glenn, told The Columbus Dispatch that the Glenn family was not available for comment. "If protocols were violated as it appears they were, this is an unfortunate sign of the times," he said. "It violates all standards of decency." The Air Force spokesman said that when it concludes the investigation into the incident, "the Air Force will determine what further corrective actions, if any, may be necessary and appropriate. If any allegations of misconduct are substantiated, those involved will be held accountable." In 2011, the Dover mortuary was at the center of a scandal over how it handled remains of deceased service members. Zwicharowski, the mortuary employee named in the Pentagon memo, was the first employee to blow the whistle on the mortuary's practices, according to a 2013 article in the Wilmington News Journal. "Investigators confirmed what had taken place, the three top mortuary officials were disciplined and new policies and processes were put in place to handle the nation's war dead with greater accountability," it reported. Skillman's memo noted that "Zwicharowski made comments indicating he believed the inspection was an act of reprisal for having exposed, six years prior, how the mortuary mishandled the remains of some fallen service members returning home from the battlefields of Afghanistan and Iraq," according to the Times. The Air Force notes that the inspection of the Dover site was the fourth inspection of a Defense Department mortuary facility since the DOD commenced its new inspection process, and its first official inspection of Dover. The Dover mortuary passed the inspection with a score of 94 percent. "Zwicharowski said he did nothing improper by offering to let the inspectors view Glenn's remains. He said his staff had further embalmed the body because Glenn's funeral was still weeks away and wanted to show the inspectors their techniques. "Air Force officials denied they were retaliating against Zwicharowski but declined to comment in detail about the investigation, citing privacy concerns." According to the Post, Zwicharowski and other workers at the mortuary questioned the inspection team's legitimacy. Two of its members, he said, had previously worked at the mortuary and had been implicated in the 2011 scandal. The Post reports that the Air Force has reassigned Zwicharowski.